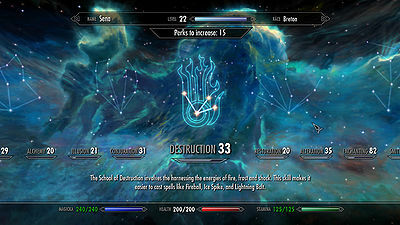 There are 18 skills in Skyrim, each of which determines how well various tasks can be performed. As skills are used, they increase in level, which increases the character's overall level. The starting value for most skills is 15, although each race confers bonuses to certain skills. Skills can also be increased by reading skill books, learning from trainers, or as a reward for completing certain quests. Guards will often comment on your skills when you are near them. Perks are a new feature in Skyrim. Each skill has its own associated perks, which can be unlocked when a character advances a level. 180 skill perks are available, 251 if including all ranks for each perk. The perks are all detailed on the individual skill pages, along with their requirements. One perk point is given to the character when the character's overall level increases. The maximum value for unused perk points is 255, four more than required for every perk. Leveling up with 255 unused perk points will cause the counter to roll back to zero and restart. Most perks have both a skill level requirement and a prerequisite perk that must first be unlocked to make the perk available. When a prerequisite perk has more than one rank, only the first rank needs to be unlocked to make the next perk available. For example, to unlock Enchanting's "Fire Enchanter" skill, only the first rank of "Enchanter" needs to be unlocked, not all five ranks. When a skill has two prerequisite perks, only one of the two perks needs to be unlocked to make the next perk available. For example, to unlock the "Extra Effect" skill under Enchanting, only "Storm Enchanter" or "Corpus Enchanter" needs to be unlocked. Perk points cannot be changed or undone once spent. With Dragonborn installed, perks may be undone and redistributed at the cost of one dragon soul per skill tree once you have completed the add-on's main quest. See this page for details. 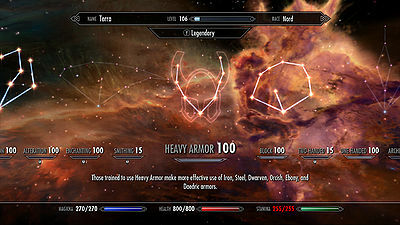 The Official Skyrim Patch version 1.9 allows a skill at level 100 to be made Legendary, which will reset the skill to level 15 and refund all perk points allocated to that skill, making them available for reallocation wherever you see fit. Players cannot 'loop round' later perks to unlock earlier ones. An example of this would be the Smithing skill tree; on the left-hand side of the circle are light armor perks, on the right are heavy armor perks, meeting in the middle at dragon armor at level 100. Although the dragon armor perk is visibly joined to both the glass armor and daedric armor perks, it is not possible to unlock all 3 without first acquiring all the prerequisite light and heavy armor perks. Prior to Patch 1.9, it is only possible for a character to unlock 80 of the 251 skill perks; PC users can use the console command player.addperk to unlock any desired perk. The skill advancement mechanism differs between skills. For example, by selling higher value items to merchants, the player gains experience in their Speech skill. Smithing skill increases have been altered by Patch 1.5, they now increase more depending on value of forged equipment. When using a grind wheel or table, the amount the enhanced equipment value goes up defines how much experience gained for it. With 90 smithing and 100% smithing enchanted gear, enhancing an ebony bow from base increased experience almost an entire level. For more details, see each skill's article. Trainers can help level up a skill for a maximum of five times per character level. Unused training sessions do not carry over to the next level. For information on how to gain free skill boosts, see this page. Version 1.9 of the Official Skyrim patch allows skills to be reset to their minimum of level 15 and retrained while refunding any perk points allocated to that skill. The skill level reduction allows the player to exceed the previous level cap of 81, and eventually gain enough skill perks to have all the perks for all skills, at the cost of their current proficiency in the skill. Each skill can be reset multiple times, and they will be marked with the symbol of the Imperial Dragon and a number indicating how many times it has been reset if done so multiple times. In order to unlock all skill perks, the player needs to reach level 252. For a level 81 player with all skills at 100, this requires skills be reset 147 times, with each skill that was reset brought back to level 100. Note, however, that if the player ever reaches more than 255 unspent perk points, the number of perk points available rolls over to zero at 256 unspent points and starts over, causing you to lose those points. When pending a character level increase, leveling up skills will add to the progress bar of the next level. In the skills menu, the nebulae in the backgrounds of the three different categories of skills have the shape of the correspondent category: a mage for the magic skills, a thief for the stealth skills, and a warrior for the combat skills. Some quests are only offered to characters who have certain sufficiently developed skills, specifically, the quests given by mages of the College of Winterhold when you have reached a skill level of 90 or 100 in one of the six schools of magic. Increasing developed skills leads to faster character level increases. Faster skill increases are possible by activating certain Standing Stones. Even though Archery is considered a Combat Skill, Thief Stone enhances the skill gain in Archery, not Warrior Stone. Because Skyrim does not have classes, the distinction between major and minor skills from previous Elder Scrolls games does not exist any more — characters do not have a predetermined list of skills that increase more quickly. Armorer: Weapons and armor no longer require repair, though smithing allows the player to improve these items and create new weapons and armor. Athletics and Acrobatics: Running, jumping, and swimming ability are now based entirely on race though you can sprint longer with more stamina. Blade and Blunt: Weapon skills are instead divided into One-handed and Two-handed skills. Perks within those skills allow you to specialize in certain weapon types. Mercantile and Speechcraft: Combined into the Speech skill. Morrowind's Enchant returns as Enchanting. Daggerfall's Pickpocket returns as Pickpocket. This page was last modified on 17 October 2018, at 18:32.